Thomas Edward Perez (born October 7, 1961 in Buffalo, New York) is an American politician, consumer advocate and civil rights lawyer. On July 23, 2013, he was sworn in as the United States Secretary of Labor. Perez is a member of the Democratic Party. He previously was the Assistant Attorney General for the Civil Rights Division of the United States Department of Justice. 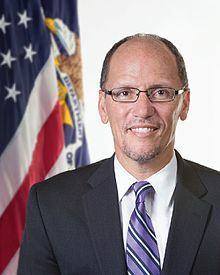 Perez announced his candidacy for Chair of the Democratic National Committee in the 2017 election on December 15, 2016. On February 25, 2017, Perez was elected Chairman on a second ballot. Minutes after being elected, Perez named Keith Ellison as deputy chair. ↑ 1.0 1.1 David Wallechinsky (9 April 2013). "Secretary of Labor: Who Is Thomas Perez?". AllGov.com. Retrieved 30 April 2015. ↑ "Secretary of Labor Thomas E. Perez". United States Department of Labor. Retrieved 30 April 2015. ↑ Weigel, David (December 13, 2016). "Labor Secretary Tom Perez will join race to run DNC". The Washington Post. Retrieved December 15, 2016. ↑ Dovere, Edward-Isaac (December 14, 2016). "Perez set to make his run for DNC chair official". Politico. Retrieved December 15, 2016. Wikimedia Commons has media related to Thomas Perez. This page was last changed on 1 July 2017, at 07:00.